Innovative modern architecture is evident in the recently opened San Joan de Reus University Hospital, on the outskirts of the city in the southern part of Catalonia. This is yet another example of where the countries of Europe lead the way when it comes to modern architecture. I only spent little over an hour in Reus on the way to the airport. My original plan was to spend a few days getting to know the city (I’d never been there before) but as time just seemed to run out all of a sudden that was one of the plans that suffered. It seemed quite an interesting place, in a quiet way, and sitting on the bus I thought to return and make an effort to spend some time there in the future. 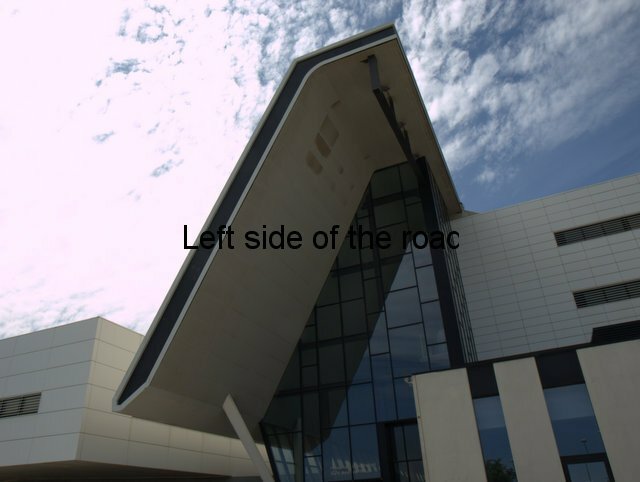 That became a certainty as the bus to the airport arrived at the edge of the city itself and the beginning of the industrial estate that contains the airport. Coming around the corner we passed along the whole length of one of the most impressive hospital buildings I’ve ever seen. 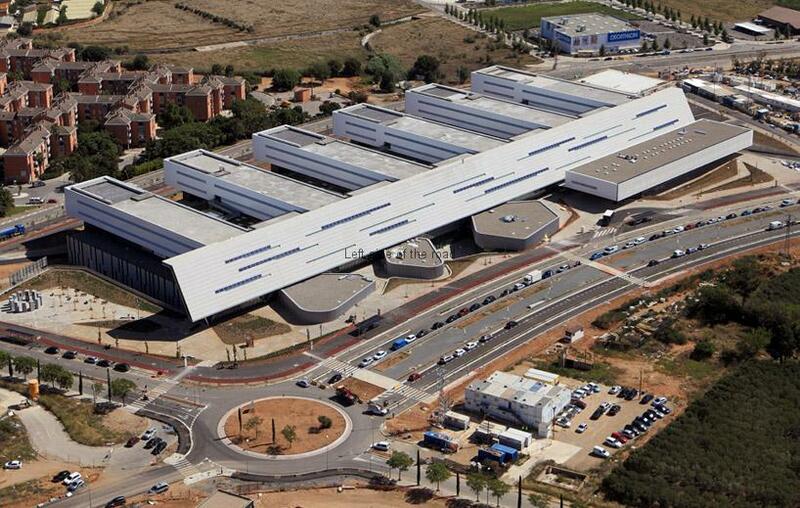 It’s officially called the San Joan de Reus University Hospital and was opened only a couple of years ago in 2010. For such a huge building there didn’t seem to be a lot of activity so, at the time of writing, I’m not sure if it’s one of the white elephants that seem to proliferate on the peninsular at the moment. It seems far too big for such a small place as Reus (but it does have a large oncology unit that serves the Tarragona region). There was a programme on British radio, more or less 6 weeks ago, about the airport in Ciudad Real in Castille, that was opened and then closed within a couple of years and now lies collecting cobwebs. The Reus hospital comes from the architectural practice of Mario Corea, based in Barcelona. Its mission statement for the project introduces an interesting approach which other architects could do well to consider. ‘The project is presented as a major horizontal unit with light wells on which six two- storey hospitalization volumes rest as if they were floating. But that didn’t come cheap. The cost ranged from 120 to 170 million Euros on the different websites I consulted. Don’t know why there is such a wide variation, it’s not as if you can just ‘lose’ 50 million Euros – or can you? As I was on my way out I don’t have any pictures of my own of the hospital but have provided a few links to some web sites which will give you an idea of what I’m talking about. On those pages there are a mixture of photographs and artist impressions. But when I see buildings like this the question that comes to my mind is this: why does Spain, and has done so for, at least 25 years, benefit from interesting, innovative and aesthetically pleasing architecture when we in the UK are (more often than not) presented with the second class, the generic and the banal? This is the case even when world-famous British architects are involved. For example, Foster has a huge practice just outside of Madrid, you pass it if you go to Segovia by road, due to the fact they have been commissioned to see through a number of projects in the country. And when British architects win commissions in Spain their creations are something unique, different and distinctive. Whereas in this country we get designs which seem to be ‘off the shelf’, with little originality and if they have anything to say about them it’s that they are tall, as can be seen by The Shard in London. And that seems to be the ambition of those who want to develop the waterfront in Liverpool. For reasons which I just can’t fathom they want to make the Liverpool skyline rival that of Shanghai. Why? I’m not that impressed, personally, by what I’ve seen of Shanghai (which I haven’t seen in actuality) nor Hong Kong (which I have) but I’m even less impressed with the idea that Liverpool should compete with those two destroyed cities on the other side of the world. The early 20th century Pierhead is unique. Those three major buildings (and some of the others close by, on or close to the Dock Road) mean the only place in the world you can be is in Liverpool. If we are to get some new buildings along both sides of the Mersey it would be a pleasant change if we had structures which can be compared favourably to the bridges of Santiago Calatrava, for example, whose structures have actually enhanced the Guadalquivir in Seville, or the Auditorio de Tenerife, which stands next to the ocean at Santa Cruz de Tenerife. The proposed design for the new Royal Hospital looks interesting but retains the idea that higher equates to better. I don’t know when I might have another chance to visit Reus but one of the places I will be heading for is this building on the outskirts of the city.